Zhang Mengxue got China off the gold medal mark at the Rio Games on Sunday, the Olympic debutant winning the women's 10m air pistol title. With an assured display of precision shooting at the Deodoro range, the 25-year-old comfortably held off Russian teenager Vitalina Batsarashkina, with Greece's Anna Korakaki taking bronze. The girl from Jinan grabbed her chance to take the title after her compatriot Guo Wenjun, the champion in 2008 and London 2012, misfired badly in qualifying to miss out on the final. Another big name missing was the Ukrainian world number one and Athens 2004 champion, Olena Kostevych. One of the two Russian teens who made it to the final, Ekaterina Korshunova, was the first to fall by the wayside. She was followed by Serbia's Bobana Velickovic and Spain's Sonia Franquet as Zhang moved menacingly into the lead. Breathing down her neck was Batsarashkina as Egypt shooter Afaf Elhodhod departed, exit stage left. Mexico's Alejandra Zavala Vazquez took fourth, leaving Zhang, Korakaki and Batsarashkina to fight out the medals. 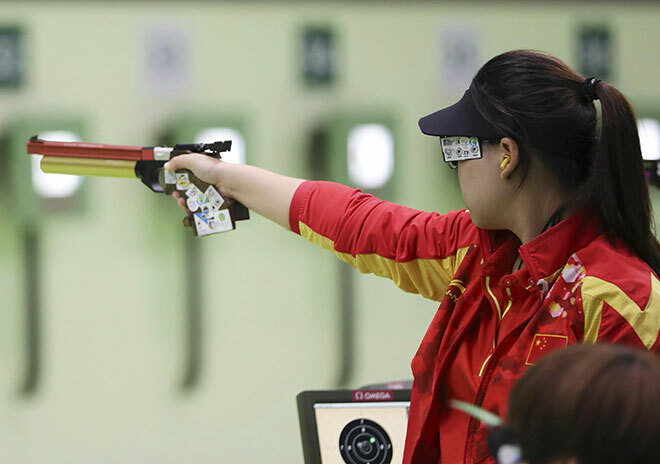 Zhang, who only made her debut in international competition in 2015, shot a perfect 10.9 in her 17th shot to pull two points clear, and seal her country's first of what they will expect to be many golds in Brazil after their opening day's haul of two silvers and three bronze.